I counted and we have three rails and not a single gap that I could spy. I'm told it's been up for four years. If fencing is your thing, it's one handsome fence. Looks to be reasonably thick boarding to me, but suspect not properly seasoned or treated. Adding a middle rail would enable it to be tightened up and would probably remove the gaps. I don't think it's been properly seasoned, as I wrote in the OP. No other wood constructions here have shrunk so much, if at all and I'm unhappy about the way they've tried to fob me off. I'm no great expert on wood but David's observatory (outdoors) and pianos (indoors) have given me some knowledge. It's normal for treated larch lap or larch feather edged fence boards to be sold unseasoned, as it's easier and cheaper for a mill to pressure treat green timber than dry timber. This has to do with science stuff, cell wall hardness and things. Fence boards will never go in a kiln to be dried, as they dry out very quickly once they are fixed anyway because they are so thin and kiln drying is a costly process, so they are always supplied unseasoned. Panels may look like they have been dried, but this is because the timber components have been hanging around long enough for them to air dry before they are made up into finished panels and sold on. 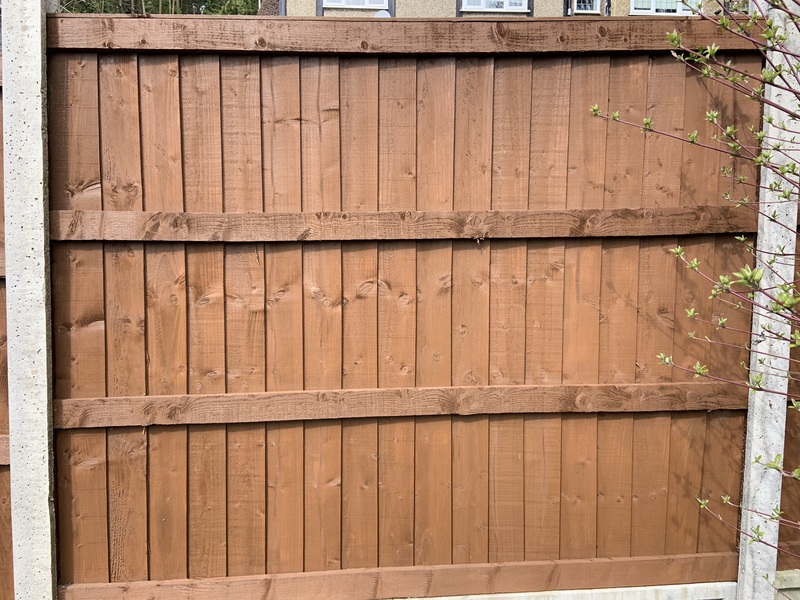 The problem with your fence is that whoever fixed the boards hasn't allowed enough overlap to accommodate the shrinkage. A middle rail will help align the boards and strengthen the fence, but will not do anything about the lack of overlap. I'll suggest a middle rail tomorrow. Lack of reasonable overlap IS something for which they are responsible and for which they should have made some more allowance. They could slip in a few more boards to cover the worst gaps, but I suspect they used annular ring shank nails ( bastards to remove without major destruction) to nail the thing together, so fixing all the gaps would mean lots of new boards all round. Ours looks like this. About four years old, painted last summer. While he was building that fence, he got offered about six more fencing jobs on the street behind it. I should have asked for commission.